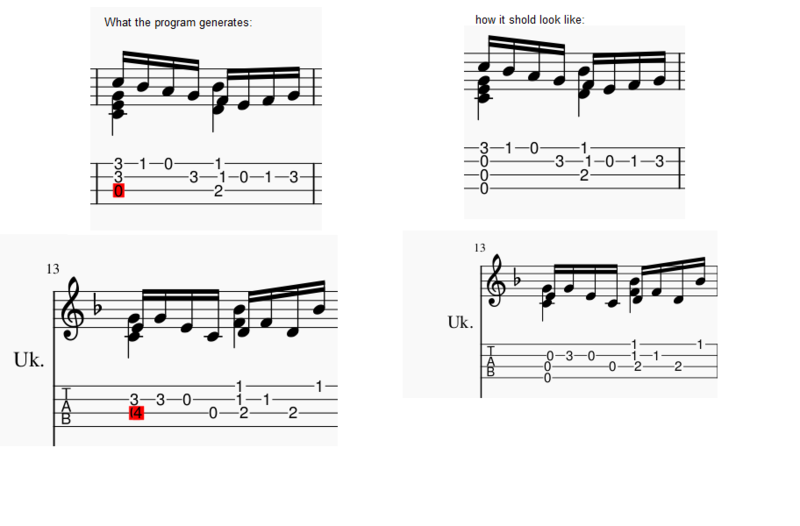 Whenever you introduce a tab staff for ukulele linked to a previously written staff the algorithm completely ignores the existence of the 4th string (tuned by default to a g4). Fixing this by hand is painful and gets messy when rewriting from the tab staff. I believe this is due to the odd reentrant tunning of the ukulele, though I hope there is an easy way to fix it. It has always been this way since I tried musescore. The problem is that there are two strings with the same tuning. When you select a note, which string do you want it on? How does MuseScore know this? You can use ctrl+arrows to move existing notes to another string. Ukuleles are tuned (A4 E4 C4 G4) and musescore seems to work fine when filling the tab while you write the music. The problem, as you see in the gif, is that it struggles to do so when the tab is added to a previously written score. The gif shows how musescore fails to write the chord when the tab is added but has no problem when the chord is written note by note. It works great for four note chords that are written so there is no choice in where to put the next note without moving other notes. If you were to try to create the same chord in certain random orders, you will find undesirable results there also. This is basically what happened when you added the linked staff to the existing staff with notes. You could also do the same thing on a guitar if you create the chord in a poor order for the instrument. In your sample you were careful to assure the notes were all on open strings until the last note, which was placed on the only unused string...Please note that the previous were thoughts I had as I was testing this. MuseScore creates (maybe reads is a better word) chords from the top down rather than the bottom up. This does cause some issues with tablatures. It also causes issues with dots missing on some dotted note chords. I've changed the title to show what the real issue is. When MuseScore wants to put two notes on the same string and gives an error when it shouldn't, this is a bug. I made it minor since you have the ability to fix it, even though it will be tedious in a long score. It was also this way in version 2 so no regression. I've been doing all of my tests in version 3.0.5 to assure these issues have not yet been fixed.